It’s January, and our porcini mushrooms have finally petered out over here in California. But like everything in life, their end heralds the beginning of a new season, our winter mushroom season on the North Coast. Our coast is blessed with damp, cool winters, perfect for mushrooms. Chief among them are our cornucopia of winter edibles: black trumpets, yellowfoot chanterelles, two kinds of hedgehog mushrooms, pig’s ears, candy caps and the queen of the forest, the chanterelle. This is what I call the Winter Pick. On a good day on the North Coast, You don’t so much “hunt” mushrooms as pick them. 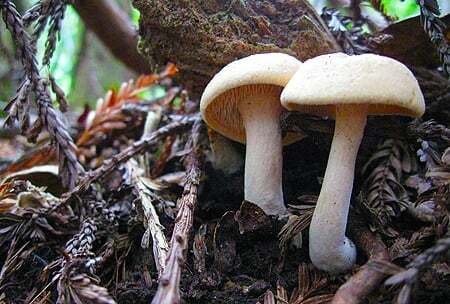 The forest floor can be carpeted with mushrooms, most of them edible. 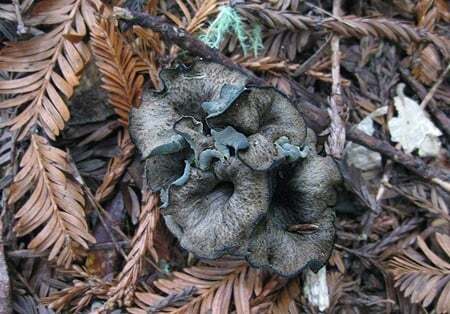 Chief among them is Craterellus cornucopioides, also known as the black trumpet or horn of plenty. This black chanterelle cousin was the prize when I went mushroom hunting with my family in New England back in September, but they don’t start popping in California until winter. And they can fruit in impressive numbers. Clusters like this can be all over the forest, usually in dark places littered with pine duff. They look like something from the Addams Family, or Beetlejuice, which — and I am sure you are not shocked about this — was one of my favorite movies of the 1980s. Black trumpets are as delicious as they are macabre. 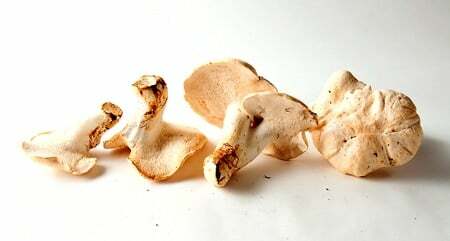 They are so aromatic, so savory that I might just like them better than the regal porcini or chanterelles. The only problem with trumpets is that they are black — and that color stains anything they are cooked with, so you need to either go with it, as in my midnight rice recipe, or cook them separately. Black trumpets are a mainstay in the dried mushroom medley I use as something of a secret ingredient in most of my stocks, broths and stews. 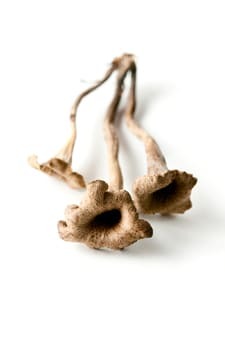 I always have several quarts of dried trumpets hanging around in my pantry. The other dried mushroom staple in my house is a brother of the black trumpet, Craterellus tubaeformis, the yellowfoot chanterelle. Candy caps, Lactarius fragilis, are another drying mushroom — although you can certainly eat both black trumpets and candy caps fresh. This little mushroom, which is believed to only live on the Pacific Coast, has an amazing power: It tastes and smells like maple syrup! Little hedgehogs are friends with black trumpets. You will often find them in close quarters in the piney-salal-huckleberry woods. Black trumpets are typically in darker places, hedgehogs where the light gets a little dappled. 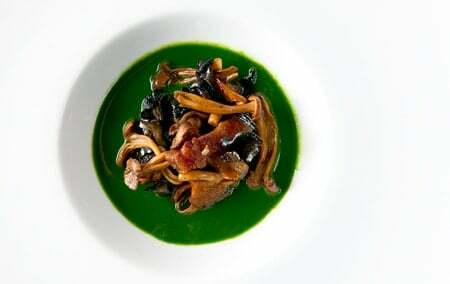 From a cooking standpoint, these are some of my favorite mushrooms of all. 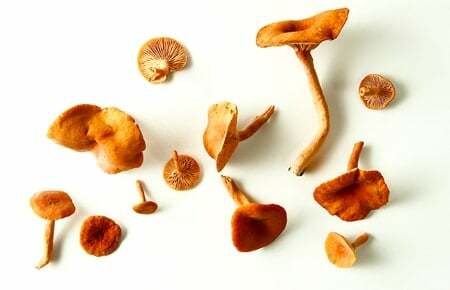 They are a lot like regular chanterelles, sweet and meaty, but without the apricot aroma. They are especially pretty sauteed. One of my favorite ways to cook them is to combine slow-cooked gizzards. It sounds strange, but this dish was judged as my best when I was in a cooking competition at Grange a few years ago. But you can use small hedgies in place of chanterelles. Large hedgehogs, on the other hand, are the porcini of winter. They can get large, up to 8-10 inches across at the cap. 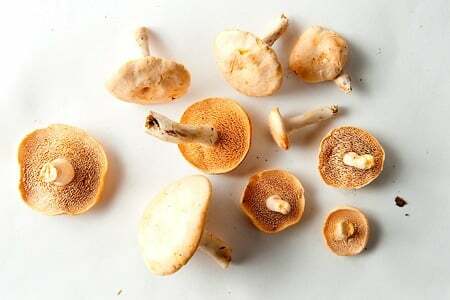 They are not as dense as porcini, but you can still slice them thin and saute or grill them nicely; they make a good centerpiece on a plate. I have a spot I’ve returned to for 6 years, under a fallen branch. It never fails me. If I catch it right, I can score a couple pounds. @ Kevin. I usually pull in pounds of black trumpets around my home in Maine, many growing in tight clusters as shown. I think there are a couple variations of black trumpet varieties. Don’t know what it’s like down south though. Out walking in Poland today in the forest and saw many Horn of Plenty, the very first time I have seen them, must have been about 10kg all high up in forest under Beech Trees on Limestone ground that was quite damp. Not far away were some Hedgehogs, wish I had a basket to put them all in now after reading about how prized they are!! !